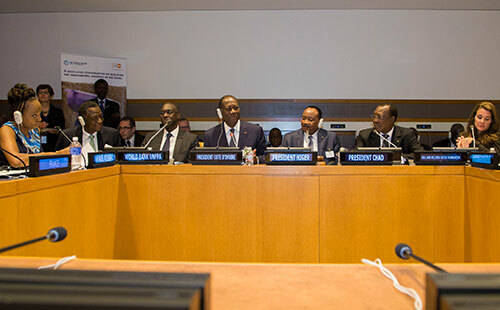 UNITED NATIONS, New York – “With significant investments in the education of young girls, sexual and reproductive health for youth and adolescents, as well as women’s empowerment in our counties, we will change the face of the Sahel,” President of Chad Idriss Déby said at the United Nations today, during a high-level panel on the potential of young people to drive economic growth in the Sahel region of Africa. Only by investing in the skills and rights of young people – particularly adolescent girls – can the region take advantage of a demographic dividend, a key opportunity to improve livelihoods and living standards, the leaders present said. A demographic dividend occurs when falling fertility rates lead to a large working-age population with fewer dependents and, therefore, more household income. Demographic dividends played a major role in the economic ascension of Asian countries like the Republic of Korea and India between the 1960s and 2000s. Today, Africa, with the fastest-growing and youngest population in the world, is poised to reap similar benefits, said the panel, which included President Déby, President of Côte d’Ivoire Alassane Ouattara, President of Niger Mahamadou Issoufou, UNFPA Executive Director Dr. Babatunde Osotimehin, World Bank Vice-President Makhtar Diop, and Melinda Gates, co-founder of the Bill & Melinda Gates Foundation. But the dividend is not automatic. It requires a healthy, educated workforce with access to decent jobs. This means investing in the health, rights and skills of young people – especially adolescent girls, who remain marginalized in large numbers throughout the Sahel and the world. "Evidence show that the demographic transition can happen in one generation." Ms. Gates said. "But it is only going to happen if we make significant investment." Unfortunately, the places where it is most critical to make these investments are the places where it is hardest to do so, such as in the Sahel. Although the region has experienced economic growth and declining infant mortality rates, living standards remain poor and opportunities are few. Approximately half the population lives on less than $1.25 a day, and fertility rates are among the highest in the world. Conditions are particularly stark for women and girls. Too few girls attend secondary school, and child marriage is tolerated in too many communities, contributing to higher rates of adolescent pregnancy and maternal mortality. The next steps are clear: Universal education, sexual and reproductive health and rights, and gender equality are known to facilitate the economic productivity of young people while also promoting their safety, dignity and quality of life. “Family planning allows that virtuous cycle to happen,” Ms. Gates emphasized. “Investing in a woman, putting her at the centre, gets you change at the village level, and then at the level of the full economy of a country,” she noted. And girls' education cannot be overlooked, President Issoufou added. "We must keep our girls at school as long as possible, including by providing scholarships to the poorest girls and their families." The World Bank and UNFPA, through the $200 million Sahel Women’s Empowerment and Demographics Project, are improving access to sexual and reproductive health, especially voluntary family planning and maternal health. The programme is also improving child health and nutrition, strengthening girls’ education, and working to ending child marriage. These efforts will involve close partnerships with governments, as well as with other UN agencies, non-governmental organizations and community groups. But further changes are also required. “Policies and investments are needed in the short-term,” says a statement of the Bill & Melinda Gates Institute for Population and Reproductive Health and the Johns Hopkins Bloomberg School of Public Health, signed by public health experts and economists from around the world. The event, organized by the World Bank Group and UNFPA, took place during the 69th Session of the UN General Assembly. It was livestreamed on the internet, with questions taken from social media participants around the world. The discussion was moderated by journalist Femi Oke.